After reading the re-issue of Claire McCardell’s book What Shall I Wear, I determined that I needed to make myself a version of a “pop-over” dress. Her pop-over dress was originally designed to either go over other clothing or be worn just by itself, but the intent was a “utility” dress to make yourself look presentable and even fashionable when you are doing household duties. Well, household duties will still find me in blue jeans, but a dress to pop on quickly to go run errands, meet a friend for coffee, or go out for a casual supper – that idea was appealing to me. 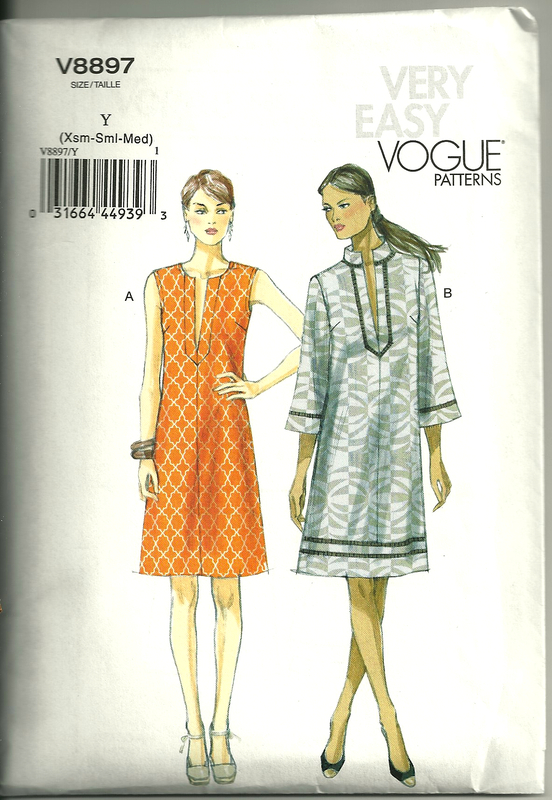 My plan began to take form when I read the June/July issue of Vogue Patterns. 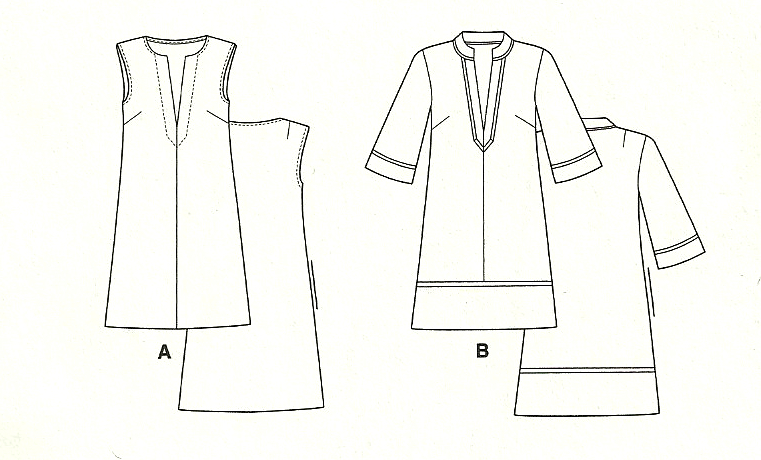 Page 86 features a “caftan-style” dress – or my idea of a tunic dress. Although I know there is a 1970s-era Vogue pattern for a tunic dress, I have not found one to purchase, so I thought I’d go ahead and get this current one. I like both versions of this dress. There is lots of room for individualization with this pattern, as a quick look at the line drawings illustrate. 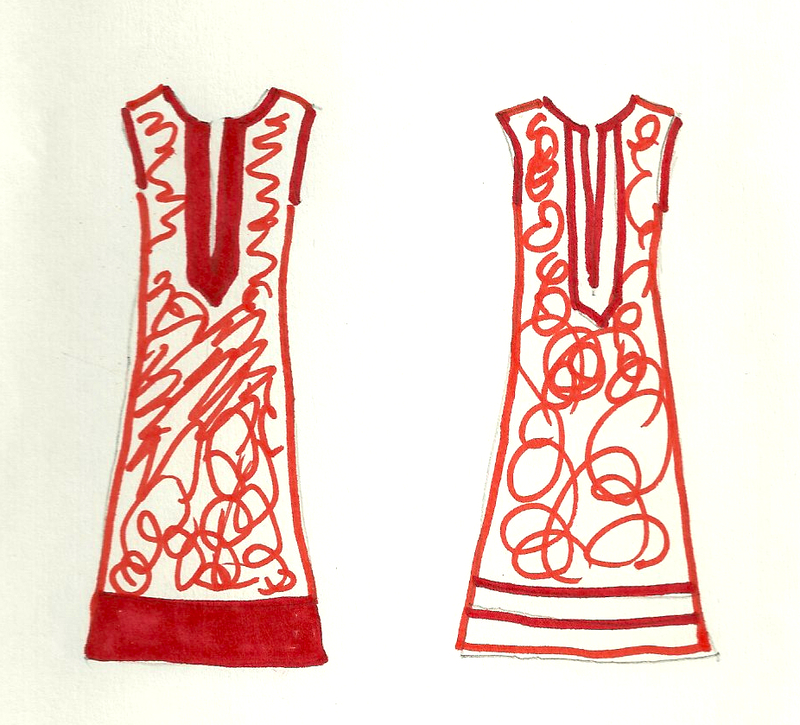 Then I doodled a bit to figure out how I wanted to treat the trimming on my tunic dress. I quickly doodled these sketches to help me determine the look I wanted. I decided to make it sleeveless so it’s cool and comfortable. 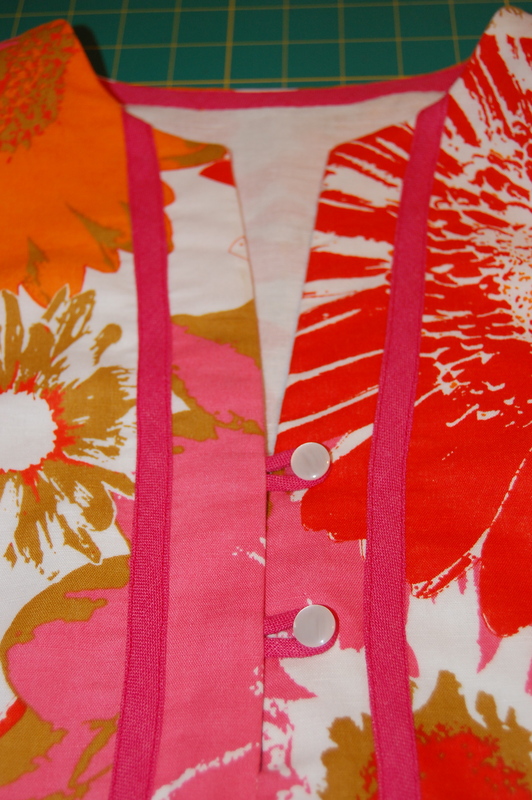 I used my Clover bias-maker to make the bias tape I needed for the trim and the binding for the neck and armholes. Because the linen blend was so lightweight, I underlined it with the same weight linen in off-white. 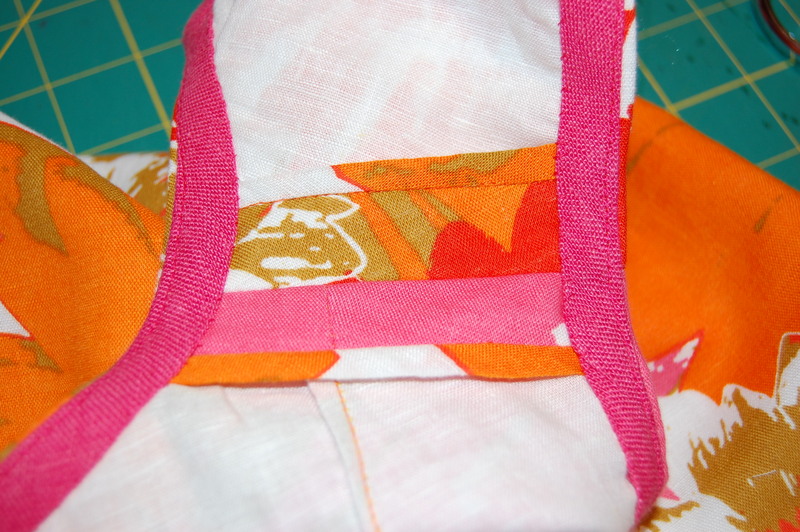 This shows a shoulder seam with a Hong kong finish to the raw edges and the pink bias binding around the armhole and neck. The front, very-low slit neckline as shown on the pattern meant one of two things: either I would have to wear a camisole underneath it, or I would have to add two buttons and loops. I decided to add the buttons and loops. I forgot to add the loops before I sewed the front neck facing in place. Then I had to re-open the seam to accomplish that little task! I turned the loops with a bodkin. Another view of the front facing. The back is unstructured and loose. This is indeed a dress I can pop over my head and go! I would definitely like to make it again, maybe with the collar and sleeves next time. 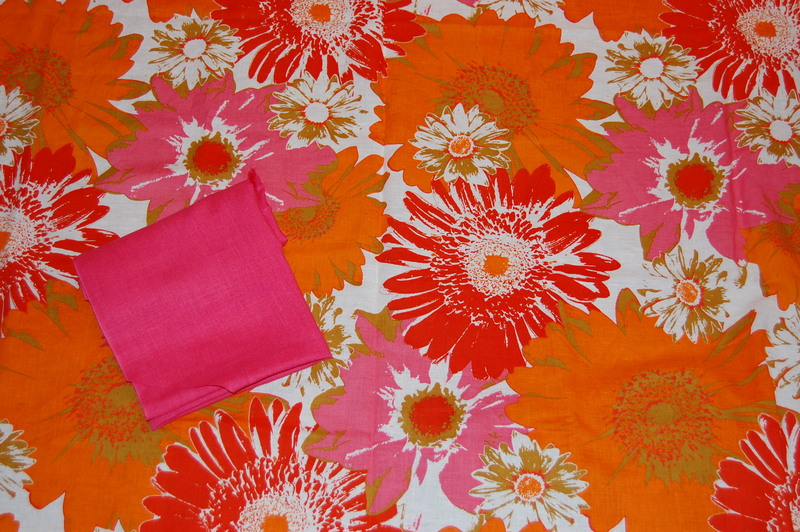 And maybe, just maybe, inspiration will come from some other fabric remnant I have tucked away, saved from the ’70s! Thanks, Brooke! 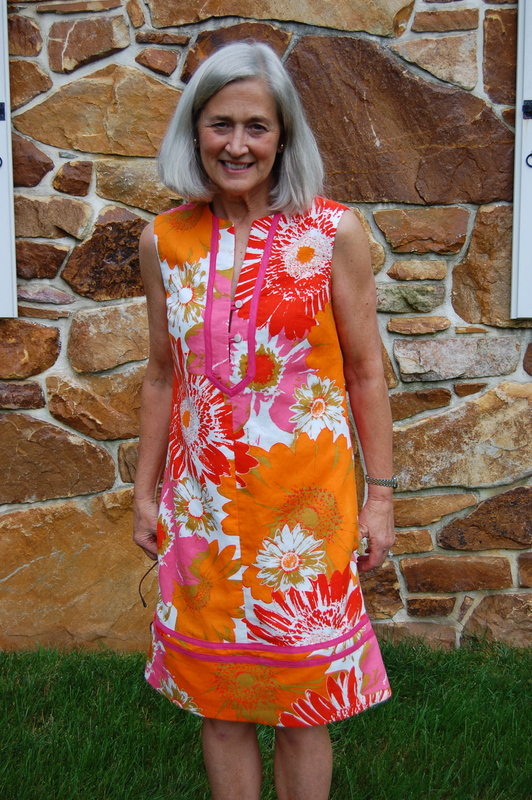 I love the colors, too – and now that Summer has finally arrived, I should get some good use out of this dress! What a cute dress! And you’re so right — suitable for lots of times from running errands to going out for dinner. Pool parties, picnics, whatever comes up, you’ll be ready with the perfect dress! Why is it that I never find such fabrics at JoAnn’s?? That is perfect for the pattern — and your work is impeccable as always! Every once in a while, I run across some great fabric at JoAnn’s. I usually find it when I’m looking for thread or buttons or anything other than fabric! And of course I always seem to have a coupon for a certain percentage off my purchase, which makes it even nicer. Thanks so much for your lovely comment! But just think – when we’re in the cold again, you’ll be wearing these types of sleeveless dresses!! Thanks very much for your comment! Ah, to die for!! 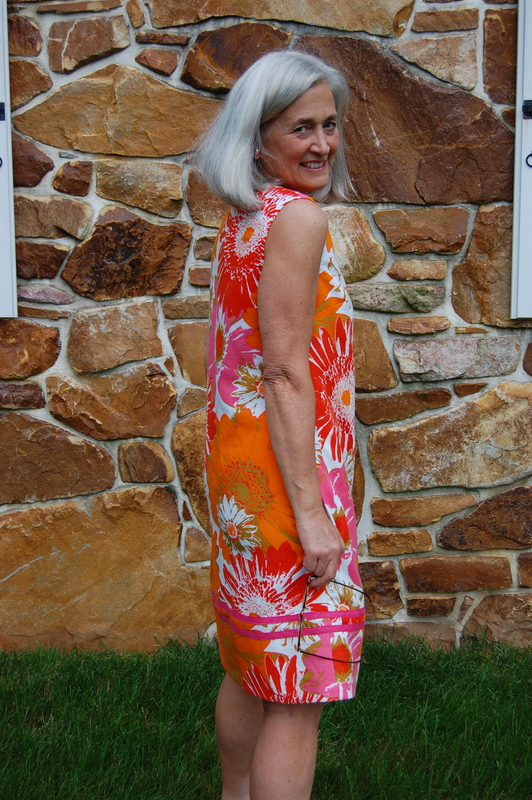 Love your caftan and the fabric you made it out of. 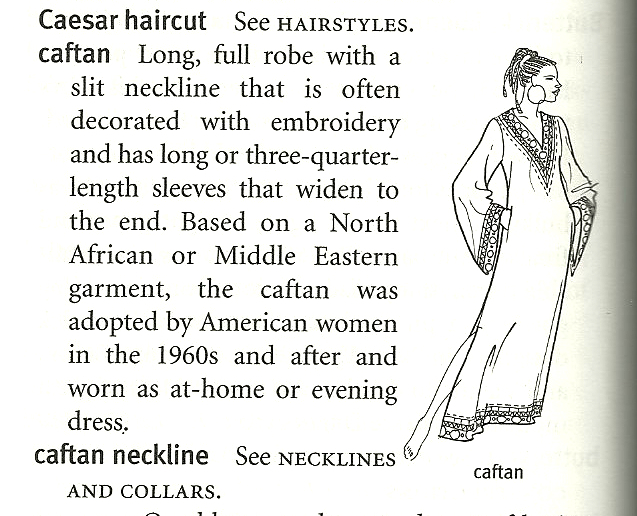 I love caftans and many other fashions from the 70’s. I actually have two “vintage” 70s patterns for caftans in my ‘stash’, Simplicity 5315 and Simplicity 5043, both from the early 70s. I will “pingback” you and your post when I make mine up and blog about them, so you can see them! Oh, I can’t wait to see your caftans made from those vintage patterns! Make them soon!! 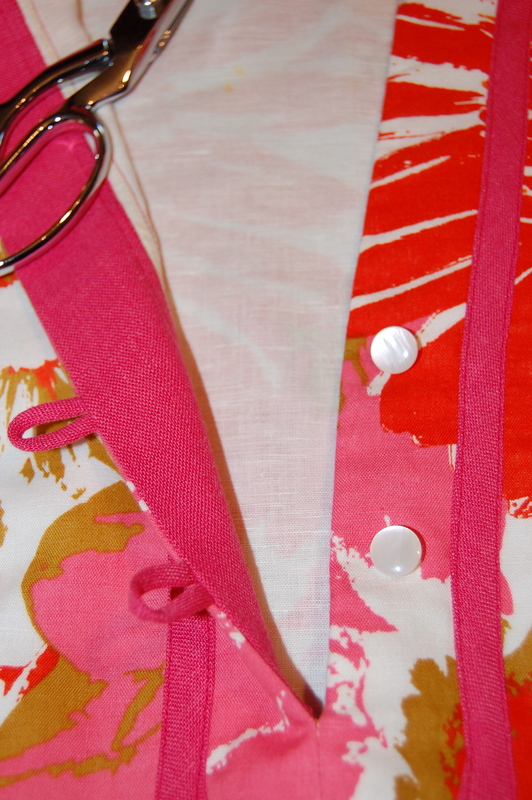 what fabulous cheerful fabric, perfect for this simple dress that really screams “summer”! Thank you! I managed to finish it just in time for the hot weather! 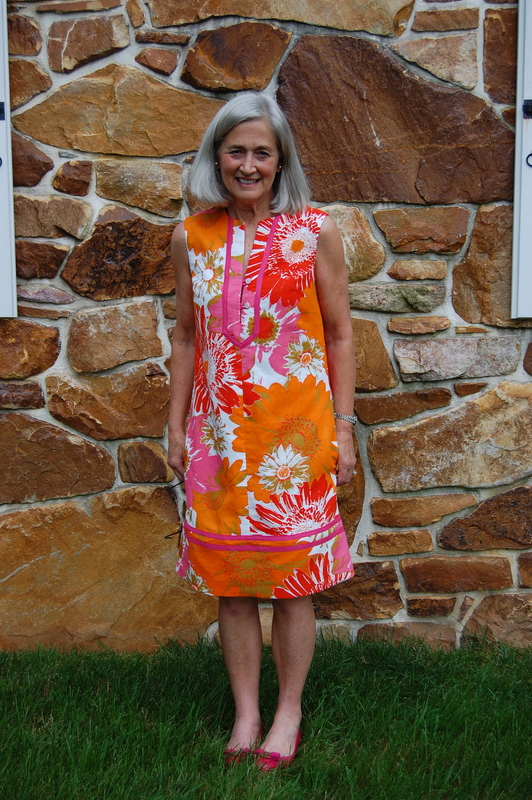 Really superb fabric, and what an easy dress for summertime. This fabric was a great find, indeed! Wow that is loud fabric and it works. It really works! I wish I could wear orange and pink and and without being completely washed out – you can. Lucky thing. I have some lovely white linen that you have got me thinking about …. Of course it’ll take months for anything to happen but I thank you for the inspriation. This is amazing! I loved seeing your dress – doesn’t the fabric look so different sewn in a different style? I think it looks great on you, by the way!